For $38 per pax, you get a 2D1N Mercure Batam Superior Room Stay with 2 Way Ferry, Pier Transfer, City & Shopping Tour (worth $118). For $48 per pax, you get a 2D1N Mercure Batam Superior Room Stay with 2 Way Ferry, Pier Transfer, City & Shopping Tour and 1 Round of Air Rifle with 12 Bullets or 60 minute Massage (worth $128). Whimsical weekend getaways in exotic countries conjure visions of lavish lifestyles of the rich and famous. 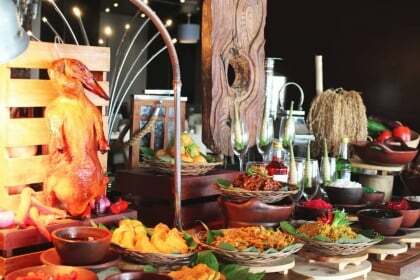 Let your whims get the better of you with today's Groupon to Batam. Forty five minutes on a ferry get you from Singapore to Batam Indonesia, where you will be greeted and transferred to the Mercure Hotel for the night. Part of the Mercure Group worldwide, this hotel offers comfortable amenities such as a swimming pool, wi-fi, fitness centre, and complimentary buffet breakfast. Have a lie down and take in the modern comforts offered within the hotel room. Try to absorb as much of the cool air-conditioning as possible, before braving the sun's rays. A popular short holiday destination for the Singaporean city slicker, Batam entices travellers to its thriving shores with promises of affordable shopping, good food, and friendly populace without the irritable sluggish feeling of long flights. Take a stroll to Vihara Maha Duta Maitreya, one of the biggest temples in South East Asia, and the Thoa Pek Kong Temple, a beautiful homage to traditional Chinese architecture. Vacationers will get to spend a vibrant day during the city shopping tour, dropping Rupiahs on chocolates, inexpensive textiles, traditional snacks, and even obligatory souvenirs for the in-laws back home. The First Factory Outlet stores an abundance of discounted goods, and with shopping vouchers included in this deal, shopping to your heart's content has never been easier.